A first in bike polo tournaments, (as far as I know) teams required to consist of men and women. I’m in! More info: Co-Ed Spring Fling! 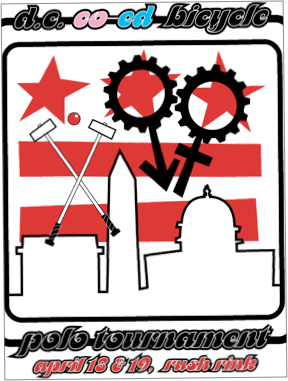 This entry was posted by Doug D on March 19, 2009 at 10:41 pm, and is filled under Bike Polo, District of Columbia, Events-Past. Follow any responses to this post through RSS 2.0. You can leave a response or trackback from your own site.